The Events room, off to the left just as you enter the Eureka library, was packed full as it has been every time I’ve been to one of these series of Saturday historical talks, which are presented jointly by the Humboldt Co. Historical Society and the Humboldt County Library. 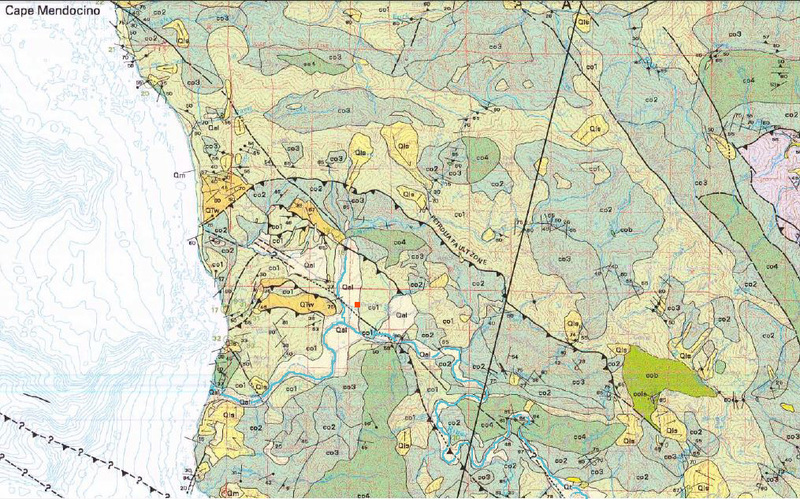 However, there were not too many Mattole faces there, so I am reporting on the presentation here, with the benefit of some of the diagrams and maps–and mostly, a paper–that Ken Aalto used in the slide show. 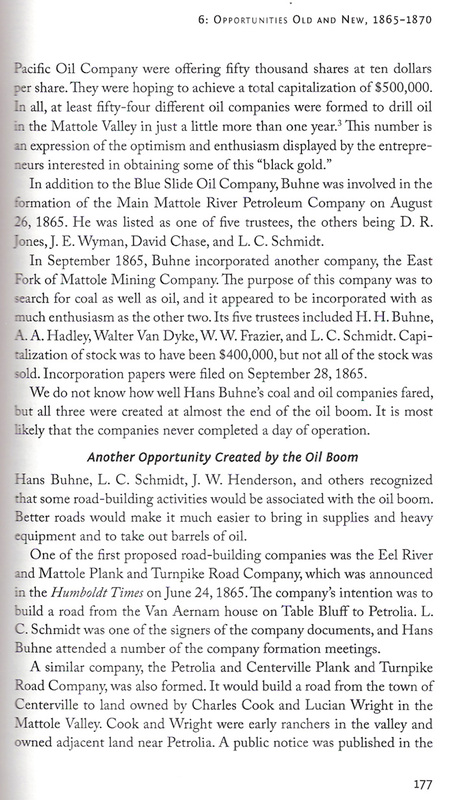 “ABSTRACT: The Petrolia oil field, the first to be developed in California in the 1860’s, attracted considerable interest and investment among oilmen because of the abundance of oil and gas seeps throughout that region. 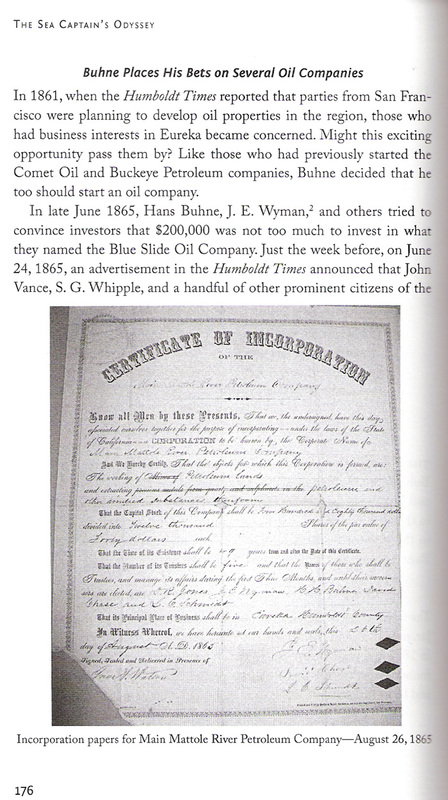 The ‘Union well’, first producing well drilled in California in 1865, yielded some thirty barrels of high quality oil, but production soon slowed to one barrel per day and the prospect was abandoned. However, over the next half-century exploration and drilling continued throughout the region with little or no success. An excellently detailed schematic of the area’s geology. If I orient myself as if I were under the ground south of King Peak and looking northwest through the Earth, it makes sense. Click on the image to make it full-screen. 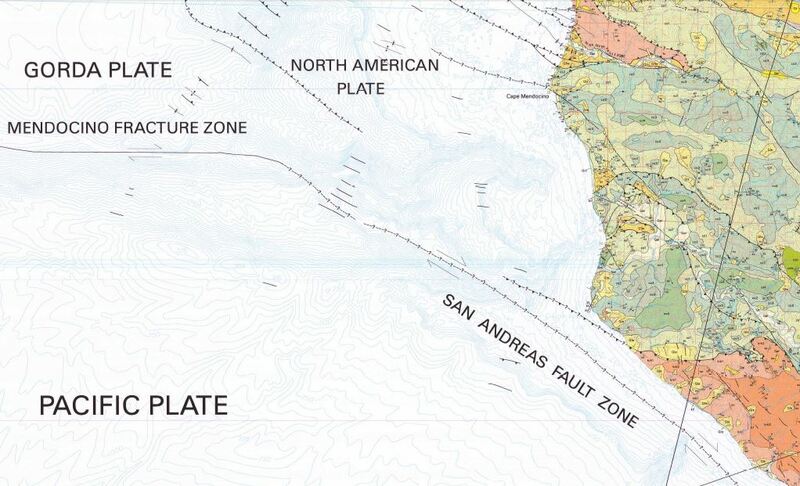 Here is an overview of the Triple Junction area, showing the older Pacific Plate, to the south, pushing up into the Gorda/Juan de Fuca Plate, which is pushing underneath the continent (the North American Plate). Volcanoes east of us are one result of the pushing of the Pacific Plate under the westward-moving North American. We all know another result! In this zoom view, I put a little red dot where the town square of Petrolia sits, and highlighted the river in blue. It’s a blur if you blow it up too much (though you should click on it once), but as I said, I can email you a better copy if you are interested. There is also a key to all the colors and codes–it’s a humongous bunch of information, too big to put up here. One thing I find interesting about this map is the line of some sort of fracture going out northwest from Petrolia toward the ocean at McNutt Gulch. Several people have theorized that at one time, the Mattole River emptied out to the sea through that gulch, and that a massive uplift of “the Table” with its flat, straight lines and abrupt rises, diverted it south to its present bed. These first three images are from USGS map series MF-2336, by R.J. McLaughlin, S.D. Ellen, M.C. Blake, Jr., A.S. Jayko, W.P. Irwin, K.R. Aalto, G.A. Carver, and S.H. Clarke, Jr., et. al. ; from the year 2000. ‘[t]he Tertiary outcrops are found as elongated strips following the structural trends [of the subjacent Franciscan Complex]. The strips are synclinal in nature and are usually overturned toward the south and bounded by overthrust blocks of the Mesozoic rocks on the north side.’ (MacGinitie 1943, p. 633). 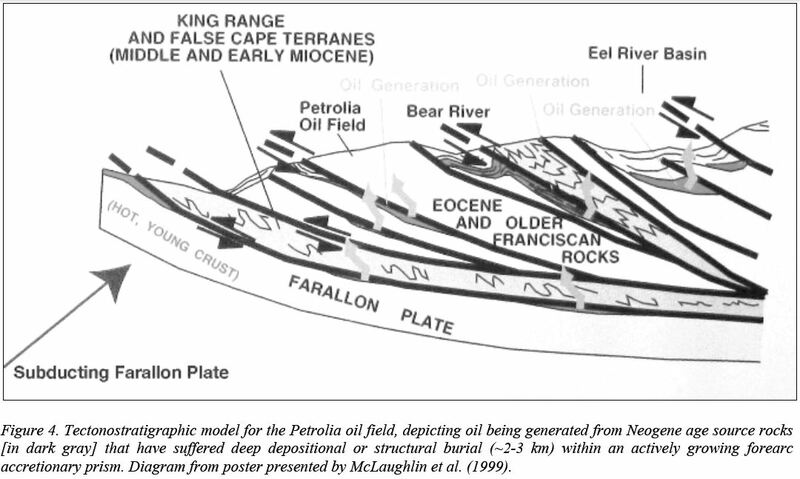 “Source rocks, originating in forearc or marginal basin settings, are thrust beneath False Cape and Coastal terranes, and possibly provide a source for the oil presently leaking from seeps and wells within the Coastal terrane of the Petrolia area (Fig. 4; McLaughlin et al. 1999). (MacGinitie, 1943, p. 635). Ogle (1953) determined that sandstone beds of Lower Wildcat Group (Fig. 3, part of the overlap assemblage) served as reservoir rocks in the gas fields developed near Eureka. Franciscan basement rocks did not appear to be suitable as reservoirs, although some sheared areas were permeable. ‘Fair to good petroleum generative potential is indicated for thermally immature Miocene shale and mudstone [of the Petrolia region], with TOC values of 1.1-1.8 wt %, HI>200, and Tmax values of about 420 degrees C.’ (Text from poster presented by McLaughlin et al., 1999). On last Thursday, Dec. 2, i attended a double book-signing party at the Humboldt County Historical Society. Dennis and Gloria Turner were presenting their new, expanded, corrected, and updated Place Names of Humboldt County, which i will write about presently; and Marvin Shepherd with his wife Patsy were meeting and greeting and signing copies of his exciting new volume, The Sea Captain’s Odyssey: A Biography of Captain H. H. Buhne, 1822-1894. Marv had visited the MVHS a couple of time in the last few years looking for material about Petrolia during the years of Buhne’s interest here. I was looking forward to his book mainly to see what he did with this Mattole information. However, now that i have the book in hand, i find it a hard-to-put-down read! 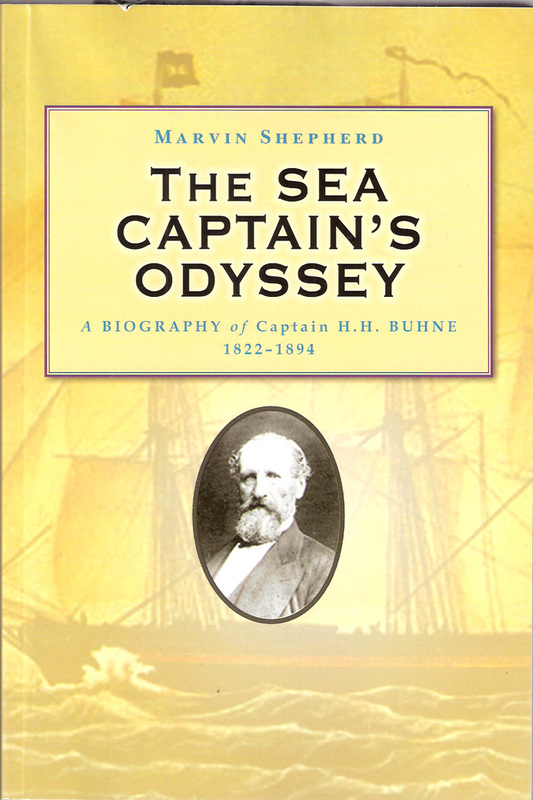 Captain Buhne, for whom many a locality and landmark in Eureka is named, left his home in Flensburg, Denmark, in 1838, as cabin boy on a whaling ship, and thus began a lifetime of ambition, adventure, and attendant hardship. 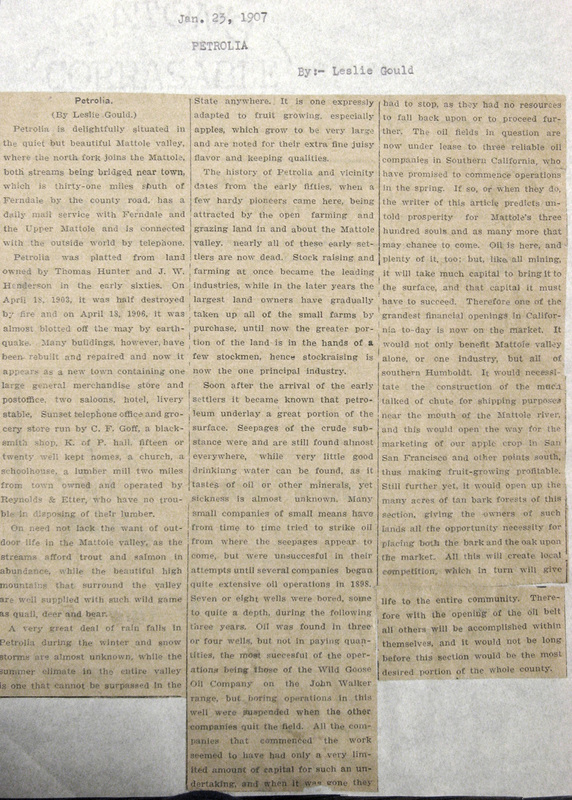 His main claim to fame in Humboldt has been piloting the first ship of American settlers over the Humboldt Bar in 1850, but there is a lot more to his story than this. Fans of Horatio Alger (as the author points out), Richard Henry Dana, and of course, of any early Humboldt history, will relish the Buhne saga. There is no shortage of dramatic life-or-death struggle here. Marv’s book is very well-written, painstakingly researched, and set up so that both the casual reader and the historical researcher will enjoy it. 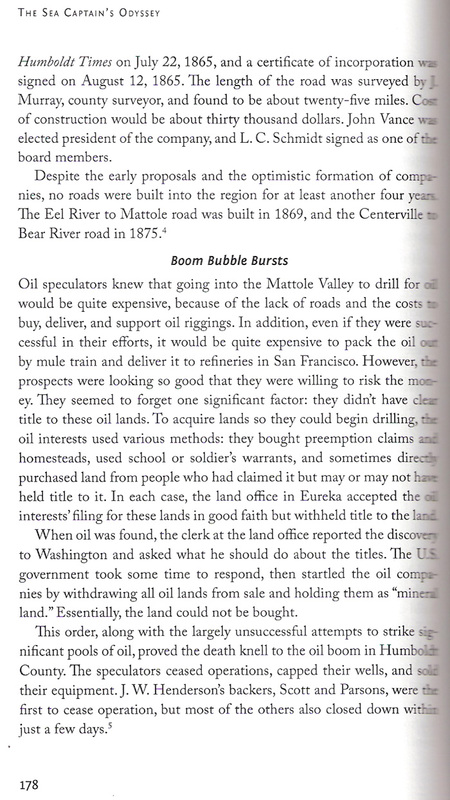 I was impressed with his section on the oil frenzy in the Mattole and the investment in the excitement by Humboldt Bay businessmen– it felt like he was doing my work for me! Marvin Shepherd kindly allowed me to print a few scans of pages of his brand-new book here. If you would like to purchase a copy, the best way for now is to visit the Humboldt County Historical Society at 8th and H Streets in Eureka (call 707-445-4342 to verify hours). Eventually Marv will have copies available online, and i will have a few at the MVHS office. Enjoy! From the Humboldt Room at Humboldt State University. Much gratitude to the HSU librarians, especially Joan Berman, for maintaining that place so beautifully and making so much available to us!